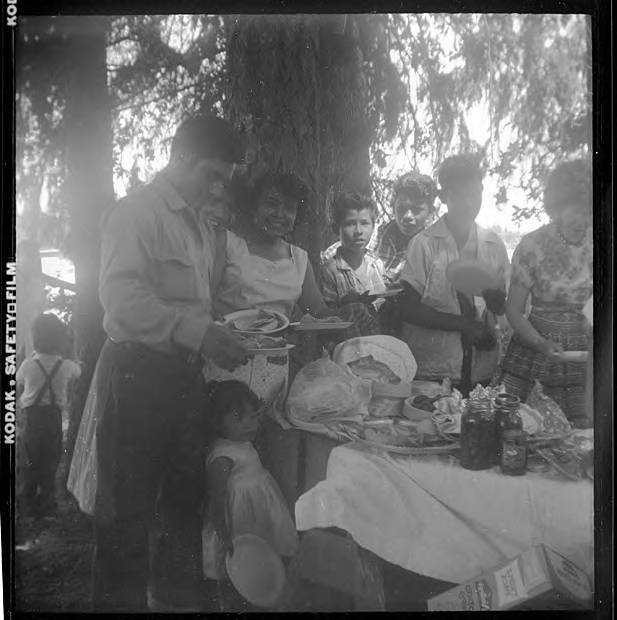 Black and white image of a couple with a small child at a picnic. Another woman looks over their shoulder, smiling, while a number of adolescent boys also stand about. The couple holds plates with food on them and appear to be in line at a potluck. Though the event being recorded in this image is unknown, museum records identify the people in the image as members of a group of 'potato pickers,' most likely migrant workers. Migrant farm labor has been an important part of agriculture in Washington County since the early 1900s, though the cultural groups which provide the majority of the laborers have changed over time.